We encourage you to visit our member marinas and we thank them for being strong advocates for the Atlantic Intracoastal Waterway! Waterside Marina is conveniently located at Mile Zero of the Atlantic Intracoastal Waterway in the heart of Downtown Norfolk, on the Elizabeth River. Boating enthusiasts and visitors alike will enjoy many conveniences and amenities such as free grocery shuttle service, showers, ice, mobile mechanical service, free Wi-Fi, winter storage, and no wake zone. Waterside Marina also features newly upgraded power and 20' deep floating docks that will accommodate mega yachts up to 270'. And last but not least, it's conveniently located directly in front of the newly renovated Waterside District featuring dining and entertainment! Zimmerman Marine manages multiple marinas and boatyards in four states along the AIWW. Beginning with marina’s in Deltaville and Mathews, Virginia, Zimmerman Marine’s holdings also include Southport, NC and Charleston, SC. Offering docking, sales and repair services at their facilities, we invite you to visit the following link to learn about the offerings at each location- Zimmerman Marine locations. Bradley Creek Marina was built in 1964 as a premier facility for sail and power boats with slips ranging from 17’ to 65’. Our marina caters to families, fishermen and those who boat just for the thrill of boating. 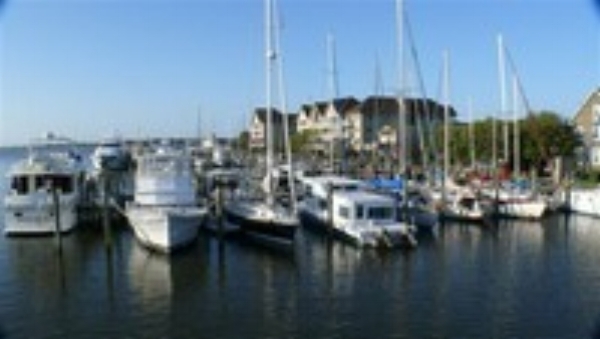 Our protected marina is conveniently located at the head of Bradley Creek in Wilmington, North Carolina. You can access the Intracoastal Waterway and Masonboro Inlet within minutes while avoiding the drawbridge and beach traffic. In 1981, Bradley Creek Marina became a “Boatominium” with memberships available for purchase. Contact the marina office for current availability and pricing. Dudley's Marina is a full-service marina in Swansboro, North Carolina that offers high-quality boating products and services. Established in 1938, Dudley's Marine takes great pride in providing the boating community all their necessities. In addition, Dudley's Marine offers boat parts and service with trained technicians, boat storage, and dockside fueling. Hewett Marina is a working boatyard with a 60-ton Travel Lift. They specialize in storing and maintenance of yachts and boats 28’ to 72’ along the Atlantic Intracoastal Waterway. 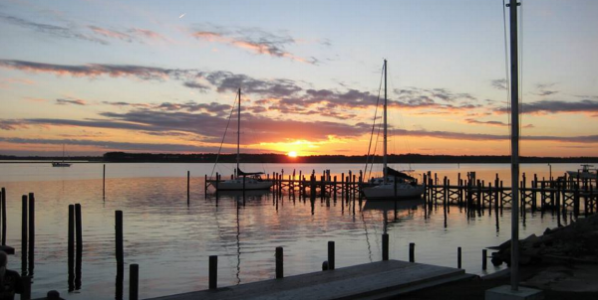 Manteo Waterfront Marina is located in a tranquil setting less than a mile from the Roanoke Sound. It is a small, deep, and well-protected harbor, and can accommodate vessels up to 150 feet in length. The marina has only 53 slips available, approximately 20 transient slips and 33 slips dedicated to seasonal and annual boaters. Pump out service is available at the marina and fuel is available nearby. Casual dining, shopping, and supplies are all within walking distance of the marina. All slips feature 30 and 50 amp power, cable television, and free wireless Internet access. The air conditioned comfort station located at the marina features separate men's and women's bathrooms, clean showers, and coin operated washer and dryer. Boaters come to Manteo for its coastal charm and relaxed atmosphere. Located on the beautiful Belhaven coastline, the River Forest Marina has been a haven for cruisers of vessels large and small for more than 70 years. Completely restored to its prime, the Marina is more than just a place to dock along your charted course—it’s a destination you’ll want to visit again and again. The Marina offers a protected harbor just inside the breakwall on Pantego Creek, a convenient waterway access to the Pungo River and greater Pamlico Sound. Conveniently located on the Intracoastal Waterway at mile 309, Marker 2A, The entire facility at Southport Marina underwent extensive renovation and upgrades between 2006 and 2008, making this one of the largest and most amenity-laden marinas in North Carolina. The full service marina has over 200 in-water protected slips with deep water access, a floating dock house and a transient / fuel dock. The new 50' high, 220 unit dry-storage facility is hurricane rated to withstand 140 mph winds and we have a travel lift capable of handling boats up to 55 tons. Wrightsville Beach Marina and Yacht Club is located at ICW mile marker 283.2 on the east bank of the Atlantic Intracoastal Waterway, one-tenth of a mile south of the Wrightsville Beach Drawbridge in a well protected "No-Wake Zone". Approaching depths to the fuel and transient docks average over 15 feet at MLW. The marina is also just 3 miles north from the "Class A" all-weather Masonboro Inlet which provides direct access to the Atlantic Ocean. Leland Oil/Marine Services Marina Marina is located on the northern shore of Jeremy Creek in heart of McClellanville, SC a short trip east off the Intracoastal Waterway, northeast of Charleston, SC. Eight slips are available and the marina offers fuel in addition to a number of other marine services. Isle of Palms Marina is located on the east side of the Intracoastal Waterway, northeast of Charleston at Mile 456.5 and south of ICW Marker 116. The minimum depth of water in the channel is reported to be ten feet and the minimum depth in the basin is ten feet as well. The marina has floating docks with rubber protection guards. In addition, the marina has slips reserved for transients as well as 300 feet of face dock alongside the restaurant that can accommodate larger vessels. Reservations are accepted. Call VHF 16 and dock personnel will assign a slip and assist you with docking. The staff is on duty during daylight hours. The Downtown Marina of Beaufort, located on the Intracoastal Waterway directly across from Marker 239, you are moored in the heart of one of South Carolina's oldest and most beautiful towns. Within 300 yards of your boat you will find restaurants, motels, B&B's and a variety of other shops located in our lovely business district. For the history enthusiasts, Beaufort's downtown area is listed in the National Register of Historic Places. The streets are lined with historic homes and churches just minutes from your boat. Walking, horse and carriage and other tours can be arranged in the Ship's Store. Charleston City Marina is located on mile marker 469.5 of the Atlantic Intracoastal Waterway in Historic Downtown Charleston. Named the 2005 National Marina of the Year by Marina Dock Age Magazine, Charleston City Marina features 19,000 feet of linear dock space covering 40 acres of water. The marina's MegaDock extends 1,530 feet and is the longest free-standing floating fuel dock in the Southeast. Cricket Cove Marina is located on the Intracoastal Waterway at mile marker 345 in Little River, SC. Since 1996, Cricket Cove Marina has been providing berthing options from personal watercraft to 150-foot yachts. We are able to store and launch boats of various shapes and sizes (up to 14,000 lbs) and also offer outside dry storage. Cricket Cove Marina has 73 wet slips built on state-of-the –art concrete floating docks and are available in three lengths, 40, 45,and 50 feet. All slips feature lockable dock boxes, shore power, and water hookups. Cable television, internet, and telephone are available through Spectrum. In addition, we are the closest marina in South Carolina to the easily navigable Little River Inlet, positioning boaters a short fifteen minute cruise away from the Atlantic Ocean. Osprey Marina offers a protected harbor 150 yards off the waterway accessible by a private deep water channel. Inside the basin, 96 wet slips are available for vessels up to 60 feet. Each slip is equipped with 30 and 50 amp power, water, and cable. Located directly on the ICW, and offers exceptional Lowcountry facilities and hospitality. The Beaufort/Port Royal area is a beautiful and historic area, and it is our intent to make your stay in the area the best that it can be. 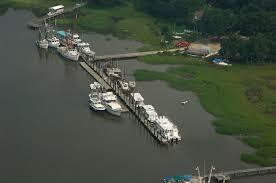 Port Royal Landing Marina is located one half mile south of red day marker 244 (mile marker 539) directly on the ICW. We have six hundred feet of easy in/easy out face dock, and we can be accessed from the Ocean through both Port Royal Sound or St. Helena Sound. Situated on the northwest coast of Hilton Head Island, South Carolina. Windmill Harbour Marina is located on the Intracoastal Waterway, just ½ mile south of the Pinckney Island Bridge at mile marker 558, 500 yards south of channel marker 27, and ½ mile north of channel marker 29 in the Calibogue Sound. The marina’s 15.5 acre harbour boasts 258 boat slips, from 25 ft. to 70 ft. Slips are available for rent or purchase. Transient dockage is available. The harbour offers a safe, tide free haven protected by a lock system directly off the Intracoastal Waterway. The Windmill Harbour Marina lock is 75′ long by 19′ wide. Hours of operation are 0800 to 1900 by harbour master or 24 hours by yachtsmen with a keycard. One of only three private locked harbours’ on the east coast, Windmill Harbour Marina offers an unparalleled combination of convenience and security…the safest place to keep your yacht. Just outside of historic Savannah, Morningstar Marinas sits on the Wilmington River at ICW marker Green 35. Whether you’re cruising the ICW, tubing on the river, fishing Gray’s Reef, or just relaxing by the river on our screened-in patio, Bahia has everything you need to make the most of your time on the water. Bahia Bleu is a full-service marina with wet slips, fully covered dry storage, transient services, quick access to the ICW, open ocean, and a variety of fishing spots, & more. Conveniently located on the Intracoastal Waterway at Thunderbolt, Georgia, just 4 miles from the beautiful Historic District of Savannah with easy access to open ocean both through Wassaw Sound and the Savannah River. From this position, the Savannah boatyard serves both Hinckley and non-Hinckley owners with a full range of yacht services. Located directly on the Intracoastal Waterway, Isle Of Hope Marina is nestled in the middle of a scenic Historic District listed on the National Register of Historic Places. It is adjacent to the historic Wormsloe Plantation and is just minutes away from Savannah’s downtown Historic District. Isle of Hope Marina amenities include 4,000 feet of new concrete docks, including 600 feet of deep-water face docks capable of accommodating mega-yachts as well as new water, electrical, pump-out and fuel systems and many of the luxuries today’s yachters have come to expect – Digital TV connections and high-speed wireless internet access at every slip. Coin laundry facilities. Located halfway between Savannah and Jacksonville, just one mile north of the Intracoastal Waterway, Golden Isles provides wet and dry storage facilities equipped to handle your most demanding boating requirements, along with amenities designed around your boating lifestyle. Morningstar Marinas/Golden Isles is a full-service marina offering first-class customer service in one of the region’s most beautiful and pristine coastal environments. In addition to the first-class amenities located at the marina, guests can enjoy St. Simons Island’s famous beaches, historic sites, golf, tennis, dining and shopping. Lake Park Harbor Marina is the only municipal marina located in the Palm Beach County area, that offers extended overnight trailer parking for boaters traveling to the Bahamas and back. Leaving from the Lake Worth Inlet, the trip to West End Bahamas is approximately 60 nautical miles. Lake Park Harbor Marina's 112 boat slips, are dispersed throughout an expansive dog friendly park setting, with breathtaking sunrise view over the Lake Worth Lagoon. It is easy to relax at the marina, with many benches, mature shade trees, and large patio with tables and umbrellas. Conveniently located between the Jupiter Inlet and the Lake Worth-Palm Beach Inlet, Loggerhead Marina - Palm Beach Gardens occupies a well-protected harbor just off the west side of the Intracoastal Waterway in the center of thriving luxury communities and three vibrant towns. At about 100 yards south of the Donald Ross Road Bridge, this marina is situated in a peaceful setting with private club amenities accessed through a Loggerhead Marina annual, seasonal, or monthly lease agreement. Loggerhead® Marina - Stuart, a truly unique location, is situated where the Intracoastal Waterway, the Atlantic Ocean and the Okeechobee Waterway all interconnect. This beautiful facility, all new within the past few years, offers cruising boaters as well as hometown locals a special spot to store their vessel. Our floating and fixed docks are designed to accommodate all shapes and sizes in perfect comfort. Loggerhead® Marina - Stuart encompasses the quality you would expect from the leader in marina service. Manatee Marina offers world class service on all major brand outboards. No matter the size of the job, we take pride in our work and your satisfaction and loyalty is one of the utmost importance to us; hence, all work is fully guaranteed. We are a Five Star Certified Service Center with over 40 years experience working on Yamaha outboards and a Yamaha Master Technician on site. In addition, the marina offers dry storage and wet slips for vessels. Marineland Marina offers a brand new marina building with showers, restrooms, and laundry + 20 new transient slips of concrete floating docks with 30/50 amp service in 40' and 50' slips with full length piers and a 100' T-head with 100 amp electrical service. Free pump-out is available at each slip on the new docks. Additional bulkhead tie ups are now available on the seawall for catamarans (no wide beam additional charges) and larger vessels up to 100'. Dredging has increased depths to 6.5' in the channel and at our 50' slips.